When you are on board, you’re (most likely) in different environment than normal. Things are different. That’s just how it is. And we’ll try to maintain some simple rules to keep daily life as smooth as possible. Being at sea can be risky, but following a few, simple guidelines will reduce these risks to a minimum. Therefore, I recommend to read this part if you are going to be onboard SY Iris. I am not going to be nagging about it, but I expect my crew to take responsibility for their own safety, and to take proper precautions. Always wear a safety jacket/vest when you are outside, in the cockpit, on deck or in the dingy. Wear life lines/harness if the weather picks up. Attach the harness to the webbing straps running along the deck. Listen to VHF channel 16 in case other vessels need help or attention. 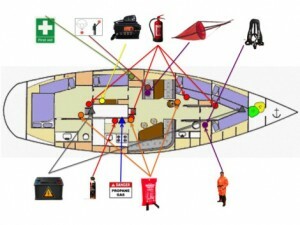 Make sure you know where the life raft is (and how it is released) and where the fire extinguishers and fire blankets are. Probably we won’t need it, but it’s really nice to know anyway. Also, make a note of where the rescue suits are stored. Shut the gas/propane valve whenever it is not in use. You’ll find it on top of the tank inside the big cupboard in the galley (kitchen). You can drink the water from the tap. It is safe, although it may taste a little “tank”. The freshwater tanks are cleaned regularly and emptied/refilled when we go to port. On board you will find one head (toilet), midships at starboard side. There is also access to a shower (and, yes, there is hot water). Don’t expect that the water supply allows you to shower every day. Please remember that freshwater is scarce, and please don’t leave the water running. There are 12v, 24v DC and 220v AC outlets at the navigation station and 24v outlets in the cabins, so you will be able to charge your stuff when needed. Under sail the batteries are charged by wind and aqua generators and solar panels.